It’s the end of the year which means it’s the time for reflection and planning. Reflecting on what has happened in 2015 and planning everything I want to make happen in 2016. While I am doing this based on the calendar year, you can perform a review at any time. Your business anniversary or blogiversary are also great times to re-evaluate where you are and where you want to go. It’s important to look back on what you’ve done and what has and hasn’t worked in order to proceed. If you’ve been using Facebook Ads and your traffic hasn’t increased that doesn’t mean you should quit blogging or close up shop. It doesn’t even mean you should stop using Facebook Ads, it just means you should re-examine your process and see if you need to try a new approach. If you’ve been using them to promote blog posts maybe use them to promote your e-course instead and reevaluate the demographic and keywords you select. These questions are pertaining to your career, blog or business. Think fast don’t dilly dally back and forth. Don’t talk your expectations down or think of all that could go wrong. Just answer. -Think fast! Do you want a promotion? Do you want to blog full time? Do you want to start freelance consulting? Do you need to grow your subscribers? Do you need to try a new social media channel? Do you need to hire outside help? What are the stepping you have to do to get there? Look at what you’ve wanted and look at your actions over the past year. Did you start contributing to publications in your niche? Did you increase your social media following tremendously? Have you done any work that contributes to where you want to be? Any trainings or courses? Once you determine this then you can figure out the basic steps of how to get there. This isn’t going to be a detailed plan. That is important and should come later but this is just to help lead you in the correct direction. Once you decide what you want to do look back over the past year (or however longer you’ve been consciously working toward your goal, if it’s less than a year) and think of what you’ve done to get towards that goal. This kind of depends on the way you work best. For me I’m a visual person so I picked out a format I liked and filled it in from there. You may prefer to figure out what you want to include and then do the visual part. Make a list if things you accomplished: New partnerships, brand ambassador relationships, number of articles published, how your online engagement or followers have grown. As a Marketing director, freelancer, blogger, influenster, event planner and social media consultant (I just got tired looking at that list) I decided to share the things I completed in those categories. Imagine this is the accomplishment part of your resume, a lot of people update this depending on the job they are applying for. Select the accomplishments you had this year that would be impressive to a potential client. If you do website design, how many websites did you launch? If you are a video blogger looking for more brands to sponsor you and send you products to review track brands you’ve worked with or put how many YouTube subscriber’s you’ve gained. 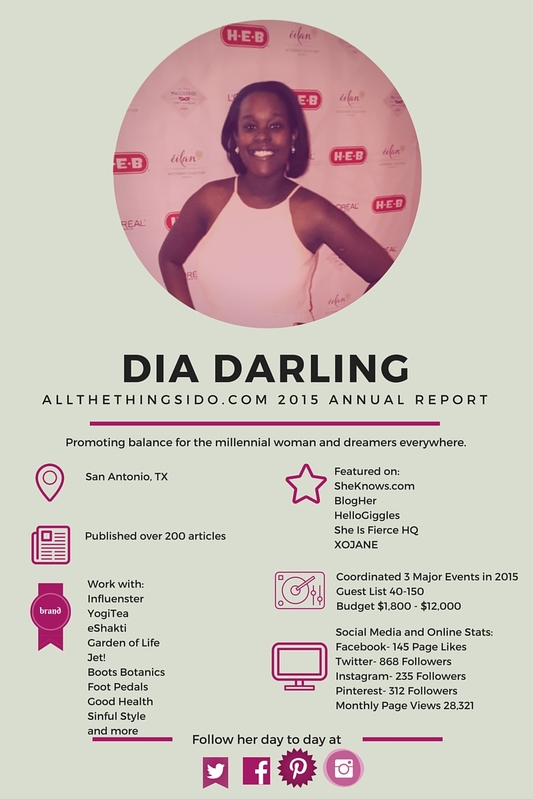 Here is the annual review I created for myself and blog using Canva . Your may see what you feel is important to share is different than mine but that’s okay. You have to do what you feel works best for your brand and goals. Thanks for visiting today and keep an eye out for Part 2. You can also subscribe here to have it come directly to your inbox. For more on using Canva here is a great tutorial about it be Adam Warner. In addition I welcome any fellow online business owners to reach out to me about this project. You can leave questions in the comments or go to my about me page and email me.